Gary and Sylvia will lead one day workshops in Texas – April 8-12, 2019. Details and registration information can be found here. Sylvia Martinez and Gary Stager will speak to high school students and teachers in Pistoia, Italy. Ca’Foscari University Dorsoduro 3246, Calle Larga Foscari, Venezia Gary Stager and Sylvia Martinez will deliver a 45-minute presentation in English on “Making, Tinkering, and Engineering in the Classroom” followed by Q&A. Audience: 40/50 university students (18-21). Il Polo Giovani B55 in Contra’ Barche 55 Sylvia Martinez and Gary Stager will deliver a 45-minute presentation in English on “Making, Tinkering, and Engineering in the Classroom” followed by Q&A. Sylvia Martinez and Gary Stager will present “Making, Tinkering, and Engineering in the Classroom” followed by Q&A. Audience: 180 education science students (18-21) at the University of Padova. Sylvia Martinez and Gary Stager will facilitate a faculty workshop and parent meetings at Charlotte Jewish Day School in Charlotte, NC. Registration is now open for CMK17 – the 10th anniversary! 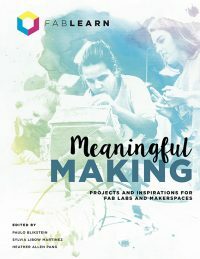 Sylvia and Gary will lead a half day pre-conference workshop for school board members, A School Board Member’s Guide to the Maker Movement, plus present a session on Educating for an Uncertain Future.